http://mcstacker.bimbimma.com/ helps in breaking down a command. Also I'd like to know how to make these custom items. I'm in the makings of a map but I need the idea for the second one. are you trying to learn how to make custom items or the custom recipes, because i modified on other peoples way of getting custom recipes, and i think my way is very easy, if youd like help with that, id be willing to show you my simple machines on my map and give you the commands you need, and explain how they work. I believe just custom items. Kind of like buying a Gold Sword with poison or throwing a Snowball that freezes mobs. my custom weapons right now is more of, creating a new way to make what was already there, as far as enchantments, we don't use enchantments on this map because we focus on natural surviving, so say you want a fire bow, you don't go to a magic table and get one, you gather ingredients to make tar, then you take the tar and combine that with100 arrows and a bow in custom dispensers, then you get a tar shortbow made by adding tar to arrows, i haven't yet dabbled in making new things like exploding items or items that freeze, that's more using particle effects, and summon command i think. And you're talking about nothing but vanilla correct? If so I'm interested in that as well. yes sir we are 100% survival we have plenty of ideas, and this server will evolve over time, we have plenty of ideas but some will take time to implement since I'm learning as i go. If you want to get a bow with 3 enchants, Just search up on the internet: Give generator and theres one thats better then MCstacker imo. Also, I can help with your server cause i have made an NPC complete vanilla minecraft and exploding weapons and ice swords and things like that. also is there a way to change exsisting villagers, like change what villagers trade ones that already exsist in the world? well certain items are banned on this server because we are set up differently, we do not use enchantments if we want something like a bow that shoots fire, we make it with a custom recipe, so we go and search for the items and put them in a custom dispenser and it replaces the items you put in with the end result a tar bow, or at least that's the name we gave it, some villagers trade enchanted items so instead of killing those villagers, i was wondering is there a way to change what they are trading? hey skyline so will this command basically erase what they originally trade, and replace it with what i tell it too? also within this command how would i make it so they don't learn new trades can you write a command where they trade at least 2-3 items, and wont learn new trades, Ive done commands with the summon and made it where they don't sell new items, i cant remember if it was the job or career, profession, but could you write a command for me and include that please. 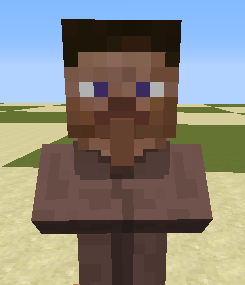 Using entity data is it then possible to change the head on a villager to skull3 for example and if so could you give me the code to do so too please? Just be aware of the nose. looks like a tongue to me or vomit.